I love Halloween. I've always loved Halloween. Yes I was one of those teenagers who shamelessly still went trick or treating with their friends even though they were definitely past the appropriate age. So given my affinity for the holiday I really miss it here in Australia. It is just not the same here. People don't decorate their houses with gusto, you don't see people wandering the streets during the day in full costume and you can not ring most door bells on October 31st without people wondering why on earth you're yelling "trick or treat" at them. Having said all this we have found a couple good streets near us that have trick or treating but if you get there past 5:30pm there are no lollies left! Trick or treating during daylight is just wrong. To combat the lacklustre Halloween festivities here I've taken it upon myself to show the kids how much fun Halloween can be. This year after ridiculously early trick or treating we're going to have a pizza party with friends. The little bears cannot wait. I was racking my brain for dessert ideas that had a nod to Halloween but also small portions, since I have a feeling a lot of sugar is going to be consumed before pizza time. 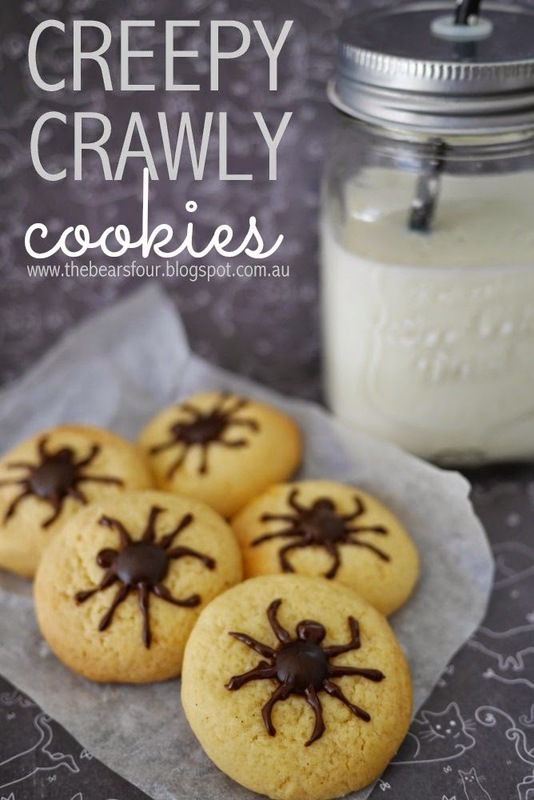 Click below for the recipe for these creepy crawly cookies. Serve with a cold glass of milk and enjoy the creepy crawlies.